Genius, a leading global brand in personal peripheral devices for the digital world, is proud to share with everyone its series of compact but powerful portable Bluetooth speaker with built-in mic support lineup: the SP-906BT and the SP-906BT Plus. 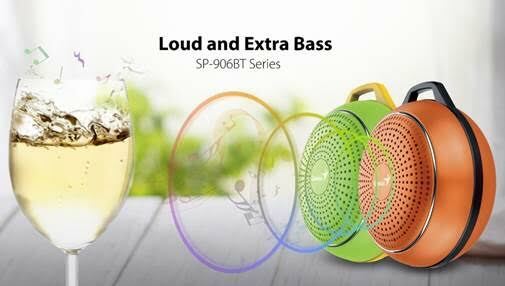 Featuring superb clear audio, stunning loudness and extra heavy bass, the SP-906BT Series gives people on-the-go more than 10 hours of continuous playing, that’s almost more than 200 songs, perfect for personal enjoyment, outdoor activities or hanging out with friends. The “Plus” edition leads the series’s expansion option firstly with a 3.5mm line-in auxillary port. The Genius SP-906BT Series was designed to encompass the most important thing about audio and that is clarity and presence. The SP-906BT Series delivers clear, vibrant sound making it a highly potent audio source. Bass fanatics can rest assured there’s plenty of bass even in the compact body of the SP-906BT Series. Whether it’s listening to music, audio books or loudspeaker calls, the Genius SP-906BT Series delivers perfectly clear, loud sound whatever the usage scenario is whether you’re using it for sports like jogging, rock-climbing, biking or hanging-out with friends partying. The Genius SP-906BT Series are portable you can literally take it anywhere with you to listen to audio from your device. Sometimes many of us will need to keep our smartphones in our bag and can’t hear incoming calls, with the SP-906BT Series and has a professional mountain climbing class hook for on-the-go, users can just clip it in their belt or bag and instantly hear incoming alerts or play audio while they do their activities. Extreme sports enthusiast will love the rugged built of the SP-906BT Series with its tough build quality and incredible endurance which is able to take a good punishment. The SP-906BT Series is designed to be compact, sporting a rounded shape and a relatively flat body gives it a slim profile so it fits in most pockets and bag without adding much bulge. The SP-906BT Plus also features metal body construction for extra durability and a unique touch of style with its sleek, metal polish. 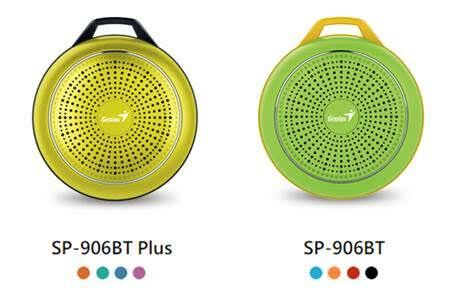 A vibrant array of color selection will never limit you to choose your own SP-906BT. Mix and match colors you want so suit your personal sense of style and fashion. Have the freedom of using any source you want whether it be your phone or any other device, the SP-906BT Series can accept both Bluetooth source and with the SP-906BT Plus, you can also plug-in your audio device like a music player or portable gaming console with the built-in 3.5mm line-in port.